Maybe it has always been this way ... I suspect it has always been this way. But interestingly, we're seeing trends in pricing, and in gross margins, that are hard to ignore. Think Apple. They managed to bump the average selling price of a phone from $637 to $687, and posted 39% gross margins in the most recent quarter. By the way, they don't discount. No 20% off. No 40% off. No taking an additional 30% off after already taking 30% off. 39% gross margin overall, north of 60% for the iPhone (66% according to this source). Think Android. According to this source, iPhones sell, on average, for 2.7x the price that an Android phone sells for. $687 / 2.7 = $254. In other words, Apple generates nearly twice as much gross margin dollars as Android does net sales dollars when selling the phone. Toss out Samsung, and it's likely everybody else selling Android phones is losing money. This is what I would call "separation". My catalog, e-commerce, and retail clients are dealing with separation ... separation anxiety, maybe. If you are wondering what kind of promotion you should run to stimulate sales, you are in the process of being separated. If you are wondering if you can get customers to pre-pay shipping and handling fees, you are in the process of being separated. I'm not convinced that you have to be a luxury brand to separate from the pack. Yes, it helps. But if you sell something unique (product or customer service or a story or a combination of all of the above), you can charge a healthy gross margin. Now, if you sell the same thing everybody else sells, then there is merciless competition. Somebody will always be able to offer a better promotion or a better price or better customer service. You've just been separated from the high gross margin businesses. Once you've been separated, you are stuck in a perpetual struggle to achieve "scale" in an effort to become big enough to generate enough profit to make your entire business model work. You've become Wal-Mart, or Amazon, without the breadth of assortment or infrastructure to effectively compete against Wal-Mart or Amazon. I hear odd comments all the time ... "If my pricing is the same as Amazon, then the customer will choose me." Why will the customer choose you? 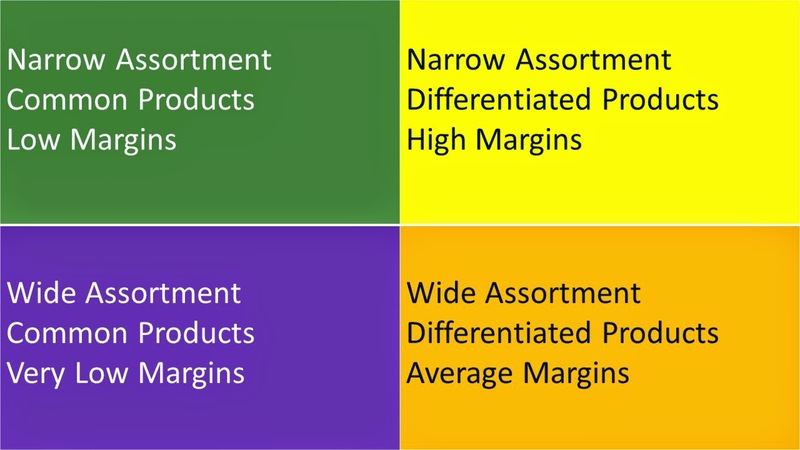 If pricing is the same, then the customer has an incentive to buy from Amazon (or Wal-Mart) simply because the product assortment is so much larger that the customer can bundle items from multiple categories for no additional work ... whereas if the customer buys from you, well, the customer has additional work to complete. So, in another sense, the product assortment facilitates separation. This ultimately separates businesses into four quadrants. Where does your business fall, across this spectrum? Do you sell the same stuff Amazon sells, but have a smaller assortment than they have? Then you're in the upper left quadrant. And you're constantly under assault from the lower left quadrant. I don't think you want to be in the upper left quadrant. But you already know that. It's easy to point the fact out. It's terribly hard to do something about it. The upper left quadrant cannot support a high ad-to-sales ratio. The upper left quadrant almost drives you into heavy discounts and promotions, to give the perception that your offering is valuable to the customer. The upper right quadrant is where Apple resides. Amazon owns the lower left quadrant. So does Wal-Mart. If you sell stuff that can be purchased at Wal-Mart or Amazon, good luck. You are being separated. A company like Nordstrom belongs in the lower right quadrant. Sure, they sell the same stuff somebody like Macy's might sell, but customer service enables the same handbag to be differentiated. This increases margins - Nordstrom moves to the lower right - Macy's moves to the lower left. This is why Nordstrom is 3x more profitable than Macy's on the same dollar of net sales. Ponder the quadrant your business resides in.